Hyundai has recalled select 2012 Veloster models for the second time in just two months over a dangerous exploding sunroof flaw. Hyundai is recalling 6,100 model year 2012 Veloster vehicles to repair shattering sunroofs. Affected vehicles contain a panoramic sunroof assembly, which may have been weakened during installation. As a result, the panoramic glass panel may break while the vehicle in motion. Such an occurrence could lead to a vehicle crash and/or injury to the driver, according to the National Highway Traffic Safety Administration. 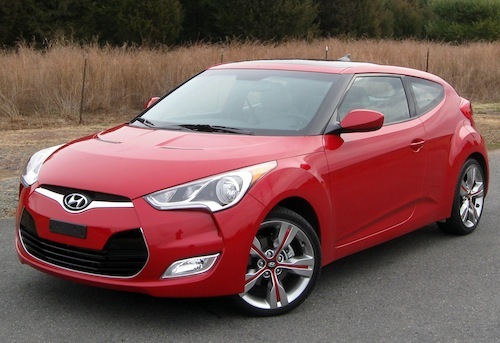 The Hyundai Veloster models in question were manufactured from July 4, 2011, through October 31, 2011. Wednesday’s recall covers 5,835 Velosters in the United States and 236 units in Puerto Rico. Hyundai will begin notifying customers of the recall in March. Authorized dealers will inspect Veloster vehicles to ensure the sunroof’s integrity and replace sunroof glass assembly, free of charge. In the meantime, owners can contact Hyundai at 1-800-633-5151. Hyundai Veloster owners can also contact the National Highway Traffic Safety Administration’s Vehicle Safety Hotline at 1-888-327-4236 or visit www.safercar.gov. Hyundai’s recall campaign number is 108. Wednesday recall is an expansion a December 2012 recall in which Hyundai recalled 13,500 vehicles, manufactured from November 1, 2011, through April 17, 2012, for the same sunroof assembly defect. The winter recall was the result a federal probe, which was launched after multiple Hyundai Veloster owners complained that their car’s sunroof spontaneously exploded. In each case, Veloster owners reported experiencing a downpouring of shattered glass after hearing a loud noise. Each of the 15 occurrences happened on vehicles with fewer than 3,000 miles. Although this particular owner experienced sunroof shattering while driving home, two other drivers reported episodes of sunroof explosion while their car was parked. One driver wrote that his Veloster’s roof shattered while he was washing his car in his driveway. The shattered glass flew as much as six feet away from the vehicle, wrote the driver to the NHTSA. Aside from the shattering sunroof recall, Hyundai recalled the 2012 Hyundai Veloster due to a brake defect in December 2012. The recall, which affected 4,490 vehicles, was issued because certain Veloster models may suffer from parking brake "binding," caused by excessive moisture and road grime. Such a condition may cause the parking brake to drag while driving, or may inhibit it from fully employing when parked. Consequently, affected Hyundai Veloster models may roll away after being parked, according to the NHTSA. The Hyundai Veloster was introduced in 2011 as a successor to the discontinued Hyundai Tiburon. The Veloster is a compact four-door hatchback, which features a unique asymmetrical door configuration. The vehicle made its debut at the 2011 Detroit Auto Show. The Veloster comes with BlueLink, a new telematics system comparable to OnStar, which provides drivers with automatic crash notification, remote control of certain vehicle features, and vehicle diagnostics. I purchased 2012 Veloster a few months ago and open the sunroof and it shattered. why should I have to pay to replace it.